The method used to make this style of lager is pretty sweet. So in the olden Germanic days, they used wooden brew kettles, which obviously cannot take on direct heat. Instead, these smart mo' fo's would superheat granitic rocks to over 500 degrees celsius and then drop them into the kettle in order to boil the wort (wort is beer before it has been fermented). This in turn would also caramelize the sugars and give the beer distinct flavors not achievable by standard boiling methods. Although this is a really cool method, I wasn't as impressed by the beer itself. Dylplow said "it tastes like a watered down porter". I have to agree to some extent. For how dark the beer looks its actually really mild on flavor. It definitely has the qualities of a lager in both the aroma and taste, which are slightly complicated by the added flavors typically found in porters. It surely is easy drinking, but I found it a bit bland and the alcohol too obvious. 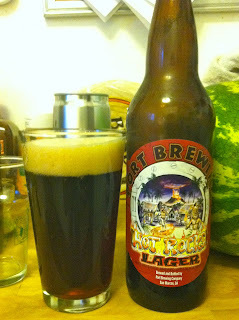 It's not a bad beer by any means, and I recommend trying it since you can definitely taste the effects of using hot rocks to caramelize the sugars. I guess I just expected more. What the hell does Dyl-y-bob Thorton know about beer anyways! ?